I am very behind this year. It’s very clear from the state of my plots and the general lack of fruit flies/the distinct whiff of damp compost in the kitchen at home. I have sowed nary a seed. This year at least I am Not Panicking. I’ve been behind before and, generally speaking, everything caught up. I might not have as many chillies as in previous years though. In the brief, warm pause before the Beast from the East’s younger sibling wandered over I managed to dig over and weed 2 beds. The beds are in much better nick than I deserve. Most of the weeds are annuals and will go to feed my compost heaps. Docks excepting of course. Much swearing about those. The difference between Friday and Sunday’s plot is stark – from balmy sun to bitter snowy cold. 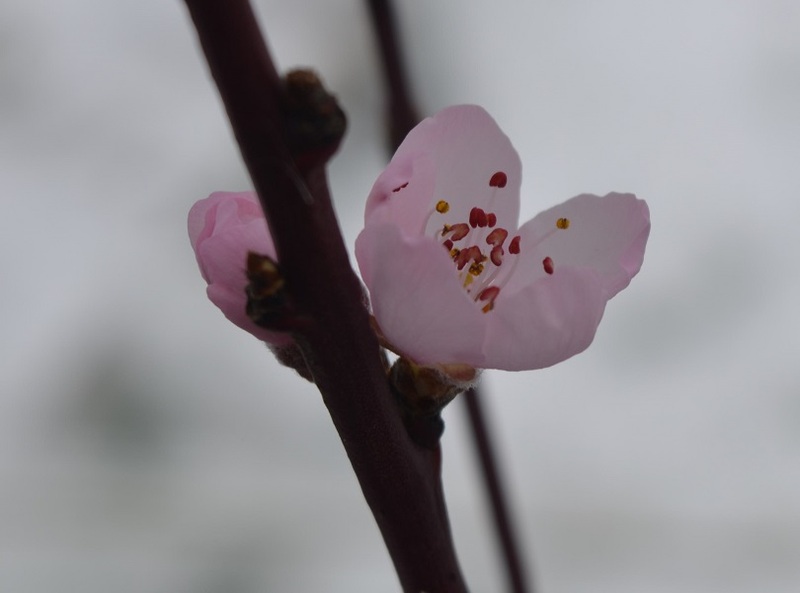 In the greenhouse my Avalon Pride peach stick is flowering, probably ill-advisedly. It is incredibly, delicately pretty, the pink flowers standing out in sharp relief against the dark bark and the lush green of a very large dock that has snuck in at the back. Last year’s mignon dahlias have formed large tubers and it looks like most have survived both winter and slugs, which is a nice surprise. I hope the same can be said for the larger ornamental dahlias I forgot to lift last autumn and have left sat in a tomb of sodden clay. This week I get to find out. They are swapping beds with some raspberries in an attempt to stop the latter singlemindedly colonising the paths and my neighbour’s plot. On which note, that particular neighbour’s plot no longer has a greenhouse. 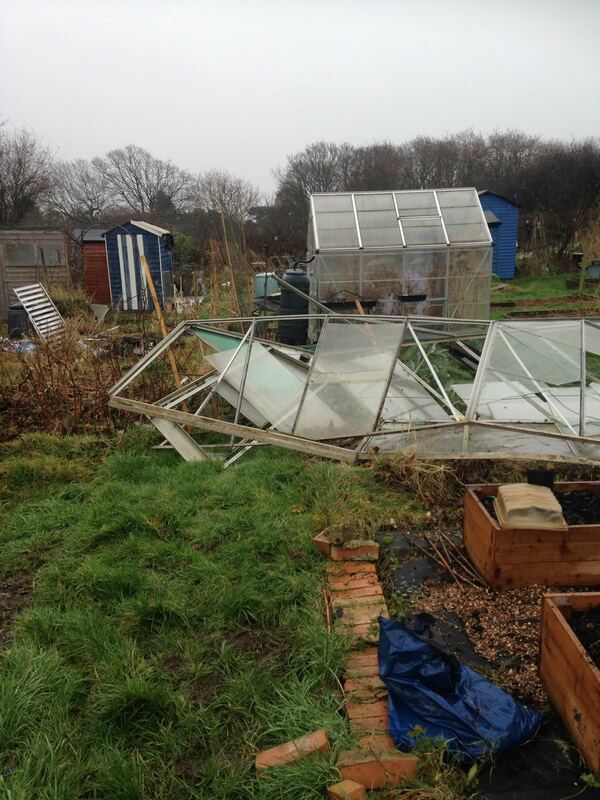 The gales in January lifted it, twisted it and dumped it on my plot. Thankfully there was no real damage. Half of it was plastic, plus it landed on tayberries, which can withstand a whomping, and saffron, which has all its important bits underground. The shards were the most worrying because I am clumsy. However, I didn’t even have much glass to find and remove as some wonderful allotment fairies got there before me and cleared the bulk of it. Andie, Tim and Lionel, thank you! I am so grateful. There are still crops to harvest. The beetroot is probably done for, likely same for yacon, but I was pleasantly surprised at how well oca has resisted frost damage. I have 3 types now: red/white, peach and what is supposed to be black but is actually a very fetching dark red. 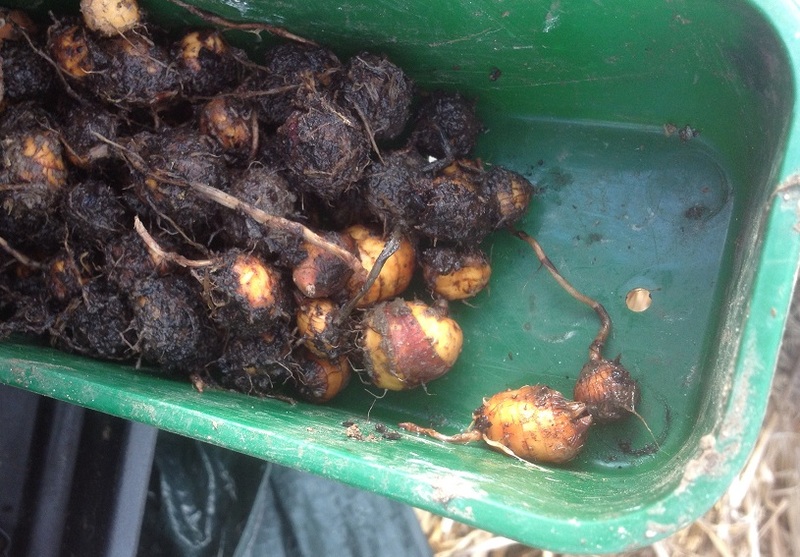 Many thanks to @rhizowen for the latter – the two tubers didn’t give a massive harvest, but I have decent-sized tubers to put in the ground this season and had enough to share in a seed circle. The peach is by far the most prolific, but the red/white makes for fewer but bigger tubers, so that one is a winner in my book. And there are tiger nuts. Lots and lots of them. Also mostly slug-free, but they are a right b*gger both to find and to clean. So much so that I haven’t eaten one yet. No one mentioned that in the enthusiastic ‘try this incredible new thing’ marketing blurb last year… If anyone has top tips, please let me know. If I grow them again, it will be in compost, not in the ground. I have time to sort it, now the snow has vanished. Weeding is going to be a regular feature for a while, and then there are a couple of big jobs I meant to do last year but were put off because Horse. Last week was awful. It included ‘my’ beloved Archie going home to his owner. After 8 months of being at the stables twice a day to look after him, to bond with him, and build dressage dreams around him, I am pretty devastated. His going leaves a huge, shaggy hole in my life. He will be fine – his owner loves him as much as I do – but it’s still hard not to have his gentle, fuzzy face watching for me. I’ve some really good friends who are being very kind, but the allotment gives peace and quiet and something constructive to do. The allotment cat is enduring a few extra head scratches. Until digging can commence in earnest the unpruned blackthorn hedge is taking something of a beating. That also helps. I’m with you. I feel behind in sowing but am not too worried. 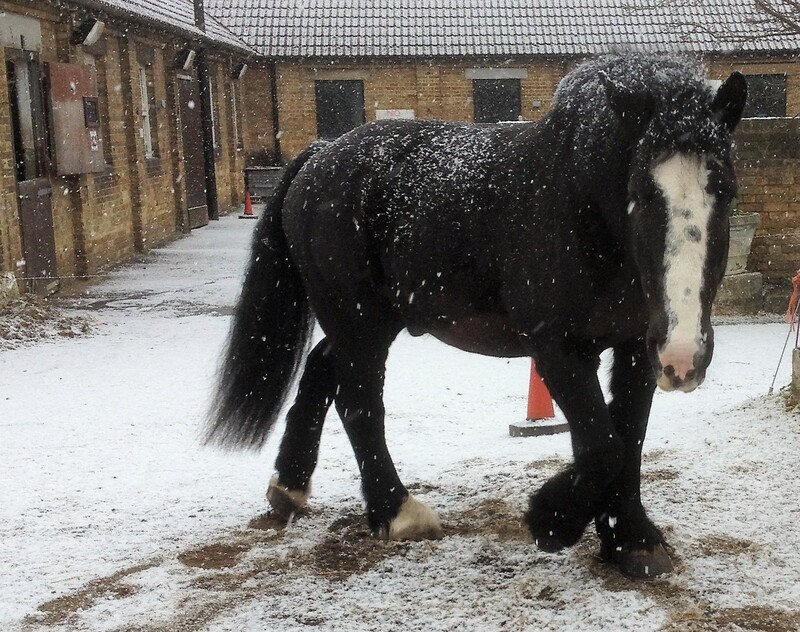 I tend to get over excited at the first whiff of sunshine (in the snow!) and think…PLANT! I’m determined not to have leggy toms this year so I am taking my time. Now if only I could resist planting an entire packet of seeds all in one go! Two rows at a time girl…. Nice to read your post! You and the allotment are a breath of fresh air. Thanks very much for writing. The sense of life outdoors is a relief to read – I haven’t begun to look at my garden under the piles of snow but your allotment is full of cheer – even the disappointments seem upbeat. I can feel the healing calm of it all!